These two images are illustrative of the tussle that goes on in my mind as the learning process continues. Is photography all about translating the reality of what I have seen accurately to the audience or is there a bit of creative license that one can appropriate? If the former, where is the creativity in it and hence why do we say that photography is an art? If it is the latter, where does one draw the line, how much of distortion is acceptable and who draws that line? And what does that mean for some of the ‘cardinal rules’ that I have set for myself? Regardless of where this philosophical discussion goes and which side of it I eventually land up at, a few days of walking around the Bharatpur Park is sure to give you moments and subjects that make you veer off tangentially to all that you have come to accept as the ‘box’. 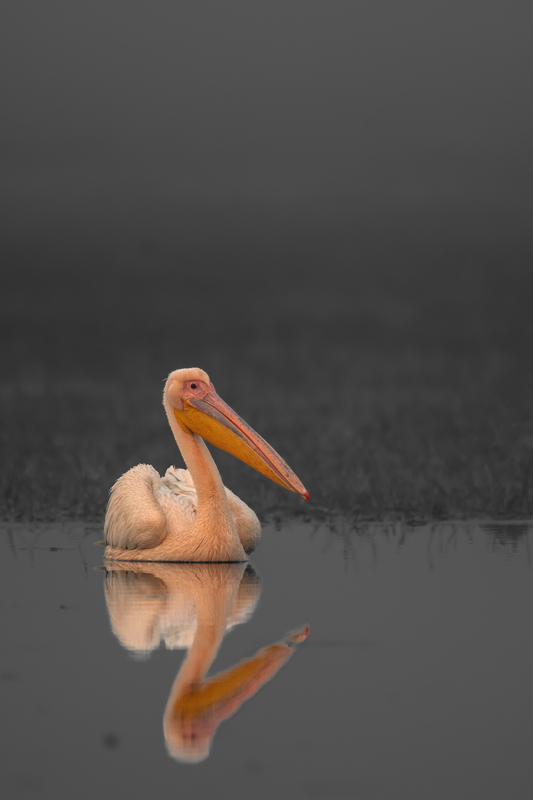 All I was focussed on was a single Pelican in the golden light of the early morning sun, so you could say that everything else in the frame, to me in that moment, was non-existent (and hence monochrome in the rendition). I know many wildlife photographers and there are two schools of thought on how wildlife photos should be. There are those who like to document what they see and they do not approve of editing. That is news photography. National Geographic uses only unedited photographs.When extremely well done that can be art. Others, like myself, like to capture what we feel. To do that almost always requires editing in post to produce an interpretation. That manipulation is art.